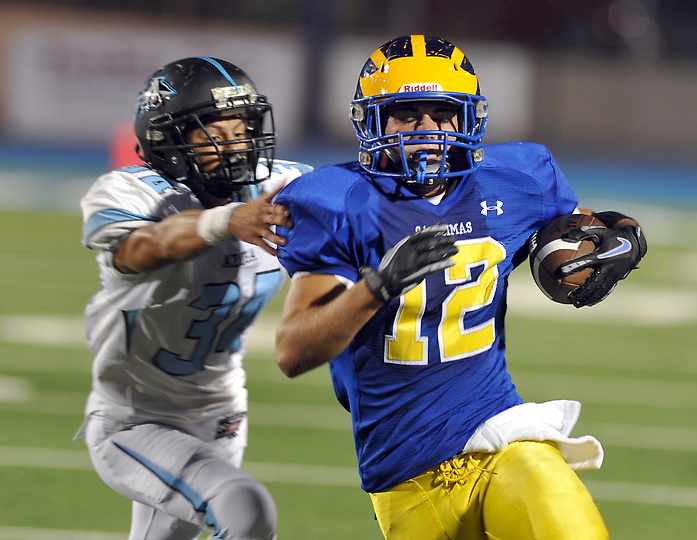 Returning All-SGV running back Jake Payton has left the San Dimas football program and is likely to transfer to Upland for his senior season. Rumors began swirling about Payton’s plans earlier this month and Payton missed a meeting to discuss his future with Saints head coach Bill Zernickow on Friday afternoon. Payton was named to the San Gabriel Valley Tribune’s first team at running back after rushing for 1,658 yards and 22 touchdowns. He was also the Valle Vista League’s Player of the Year after leading the Saints to the league championship. According to several reliable sources, Payton’s plans are to transfer to Upland. He may be with the Scots as early as Saturday when they compete in the Claremont Tourament. Aram’s take: How does Upland do it? Simply incredible. First Elijah Jones from Damien and now Payton. I don’t know enough about Upland football to say where Payton fits in. He’s certainly a fantastic player and a nice get. Will he be the feature back? Dunno. Will this move ultimately lead to more exposure and ultimately some nice college offers? Hopefully. As for San Dimas, this is a major blow, but not something the Saints can’t recover from. Payton has a bona fide home run hitter in the Wing-Z, but as we’ve seen throughout the years, Zernickow’s offense makes the stars, not the other way around. SD has depth at running back and a returning QB in Josh Avila. It’s hard to say that Payton made SD a legit Mid-Valley Division title contender by himself, but he was surely one of the top players in the division and a difference maker. Kyle Lengyel and D-Ranch head coach Roddy Layton at AFA. 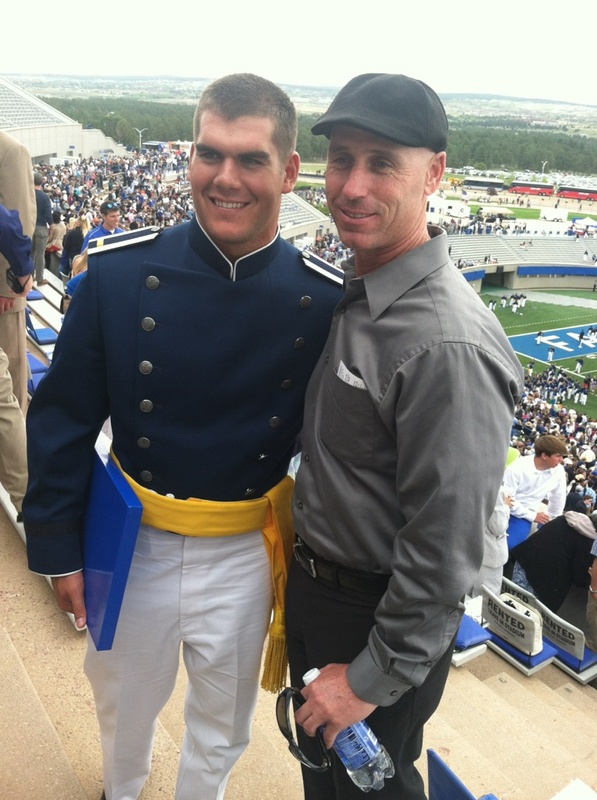 Congrats go out to former All-Area linebacker Kyle Lengyel of Diamond Ranch, who graduated from the Air Force Academy this week. Lengyel was a standout for the Panthers and instrumental in their Southeast Division runner-up seasons in 2007 and 08. Panthers head coach Roddy Layton was able to take in the ceremony in Colorado Springs. Aram’s take: Talk about a huge future ahead for Lengyel. Those service academy grads are no joke and can basically write their own tickets in this world. CIF State appeals panel will hear Antonio “Noodles” Hull’s case on June 27 at 10 a.m.
Diamond Bar football player Antonio “Noodles” Hull will have his final appeal heard by the CIF State appeals committee on JUne 27 at 10 a.m. Hull will be represented by attorney Chris Prussak, who among other things is expected to argue that Hull’s change of address should make him eligible for the upcoming season after he left West Covina in the offseason. 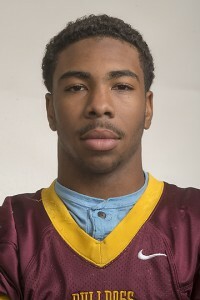 Hull was declared ineligible to play varsity football until Nov. 16, 2013 by the Southern Section after West Covina disputed his transfer to Diamond Bar on grounds that it was athletically motivated. Hull already lost his first appeal. The much-anticipated unveiling of Bishop Amat will take place this weekend in the Claremont Tournament, and then the Lancers go on their dead period before returning later in June at the Bonita Air Assault. So if you wanna check them out, now’s your chance for the near future. Anyway, the Lancers will be in action starting at 9 a.m. on Saturday on Field 4 against Valley View in the Claremont Tournament. This will be a good opportunity to see which of the Super Sophs are up with the big team and getting reps and where. QB Koa Haynes should be in action, but I’ve also heard he may be taking SATs. And wide receiver Isaac Archer, a Damien transfer, has a chance to be a special player. Claremont, Rialto, El Rancho and Pacifica. UPDATED, 7:10 p.m. PT: Chris Prussak, the attorney for Antonio “Noodles” Hull, returned my call and discussed the case and the grounds on which he plans to argue Noodles’ appeal. I will list them, but one common theme kept resurfacing and that’s that “athletically motivated” is an unclear term rule/term. “One hundred percent of athletes who make their appeal to CIF, they’re athletically motivated,” Prussak said. “They want to play athletics, therefore they are athletically motivated. Tell me the different degrees. It doesn’t say there are different degrees in the blue book, so I don’t understand that term.” Prussak will also argue that it’s unconstitutional for CIF to step in and say Hull is ineligible when he made a valid change of residence. Other parts of his case will include academics and safety/threat issues that have been alleged in other emails. UPDATED: Antonio “Noodles” Hull is ineligible for varsity football participation until Nov. 16, 2013 and not Nov. 9 as previously reported. The one-year penalty corresponds with the date that the infraction was committed and not the date of his last varsity participation with West Covina. The family of Diamond Bar High School football player Antonio “Noodles” Hull has hired an attorney to help appeal the CIF-Southern Section’s declaration of his ineligibility until Nov. 16, 2013. Hull, a junior-to-be, transferred from West Covina to Diamond Bar this offseason with hopes of playing for the Brahmas this fall. Earlier this month, the CIF-Southern Section office declared him ineligible for varsity football participation until Nov. 16, 2013 after West Covina disputed the transfer on grounds that it was athletically motivated. West Covina provided the CIF-Southern Section office with a letter from Hull’s father, which left the ruling body no choice but to declare Hull ineligible under Rule 510, which includes athletic motivation violations among other things. The penalty for an athletic motivation infraction is a one-year revocation of varsity eligibility from the date of the infraction. Hull’s family will now state its case to a state appeal committee under, and they’ll do it under the guidance of Chris Prussak, an Orange County based attorney who claims he specializes in CIF appeals cases. Hull shined as a sophomore at West Covina last fall, earning Tribune Newcomer of the Year honors after playing quarterback, running back and safety for the Bulldogs. 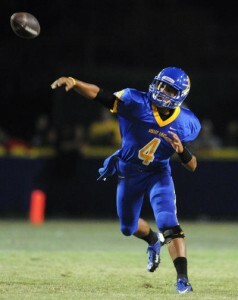 He was expected to be in the mix to play quarterback for Diamond Bar and also start at safety for the Brahmas.